Molting is when a bird will suddenly lose a lot of their old feathers and over the course of a few weeks, grow in new ones. 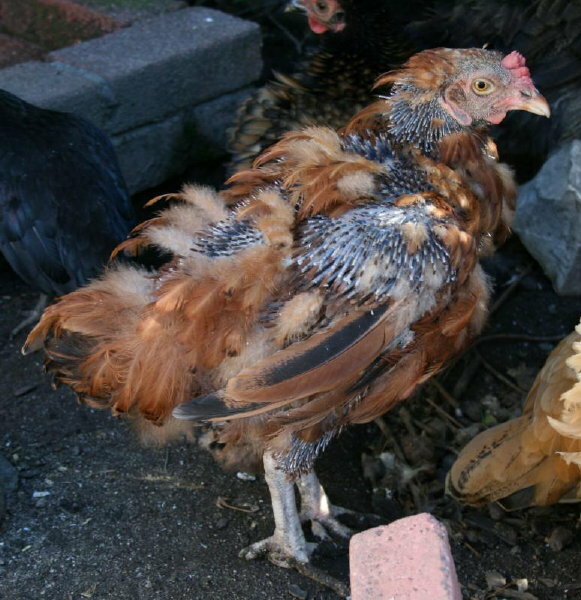 All birds molt, and in chickens the molt can vary widely--a 'hard molt' is when most of the feathers are shed while a lighter molt may involve just a few areas of the body. 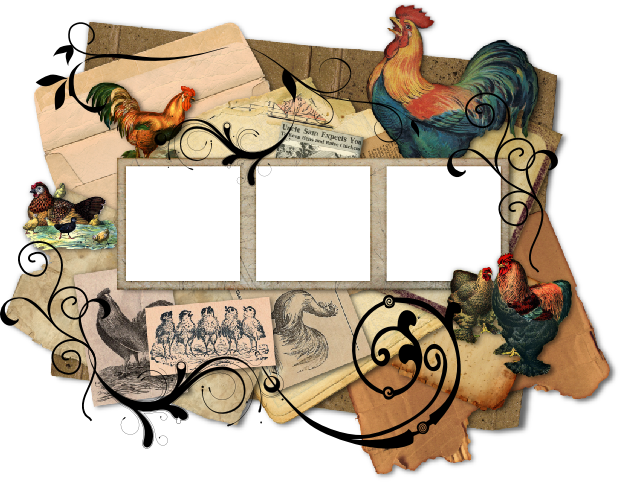 You may first notice your birds losing most or all of their tail feathers at once. Losing all of the tail feathers can be a bit of a problem within the flock socially since how they carry their tail is both an indicator and conveyor of their status within the flock and also their emotions--tail up is a sign of a bird higher in the pecking order, tail up and spread signals aggression or alert fear, tail tucked and down submissiveness or submissive fear. 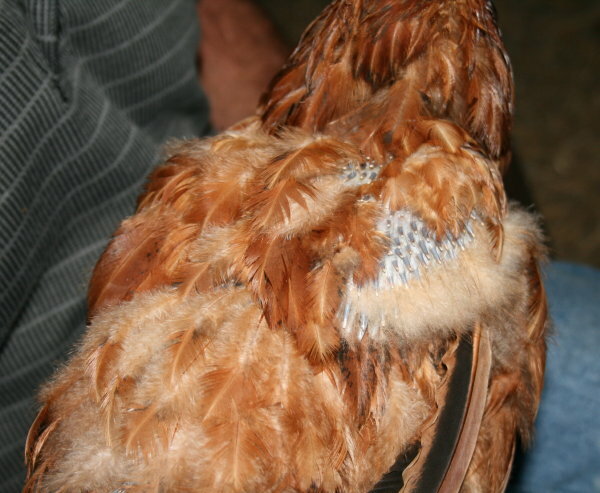 If other chickens can't read these signals because of the missing feathers and get confused, the molting bird may get an extra peck or two. Nothing too serious though. 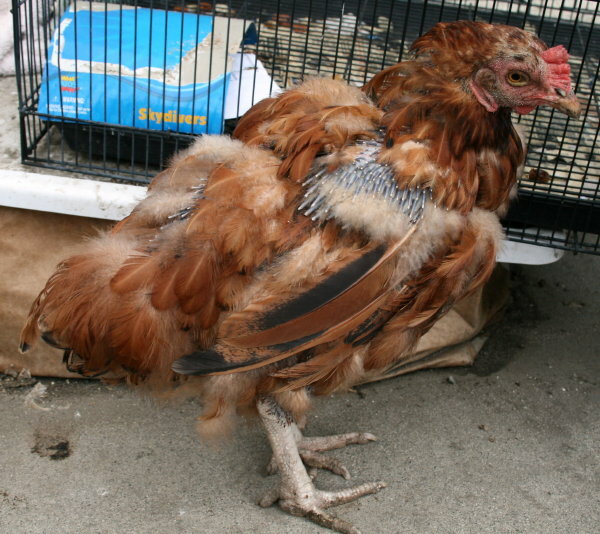 Many people freak out when their birds molt because it can be so sudden and dramatic, and all at once their bird is falling apart, nearly featherless and listless. Don’t panic! 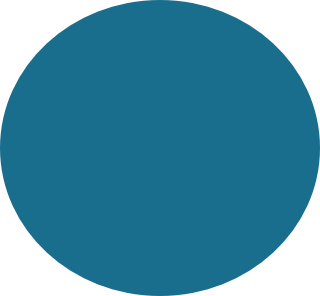 Of course you should always observe the bird for any signs of illness–weight loss, abnormal poops, symptoms such as labored breathing, sneezing, etc. just to be sure they aren’t molting AND ill.
Once you have ascertained that it’s just a molt, just buckle up and hold on, it’ll be over soon. My Head Hen, Bear, always does a hard molt and tends to look like a Chernobyl victim, it can be VERY startling to suddenly find one of your birds in this condition--you also get a good look at all of that pink skin and realize how small they are WITHOUT all their feathers, it's downright unsettling. As bad as it gets without the chicken outright dissolving, I guess. At this point the new feathers are REALLY coming in and Bear was spending all of her time being Super Grump and preening. 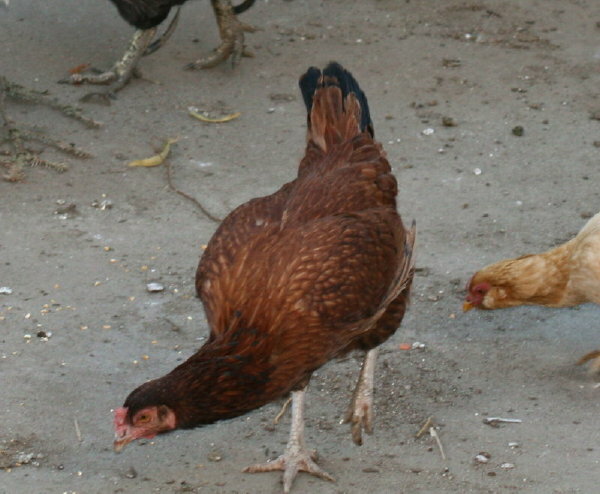 The hen in front of Bear in this shot is her daughter, Beast, who was also molting right along with her mother. Phoenix, our Head Roo, was the only one who could safely get near Bear. He positively radiated sympathy. The final shot, wherein Bear is shooting me the look she has perfected after all these years of molting: The Bear Glare. This laser-edged look can peel paint at 50 yards. Happily, all is not lost, and less than two weeks later Bear has regrown herself a beautiful new suit of feathers and is her old perky self again. ...and sneaking into the kitchen to beg for goodies. 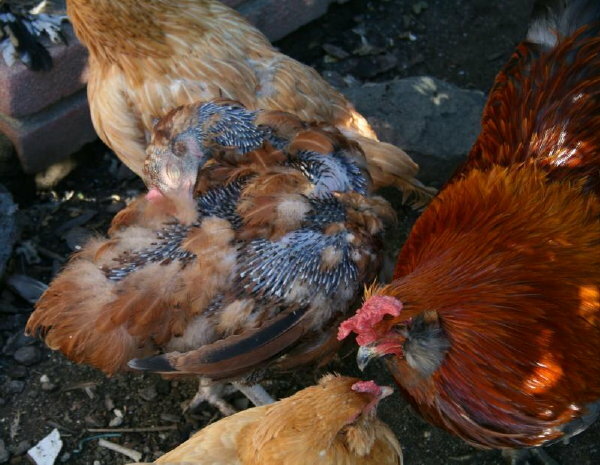 Lots of chickens do a hard molt after reaching around one year of age, give or take a few months in either direction. After that most molt once a year. 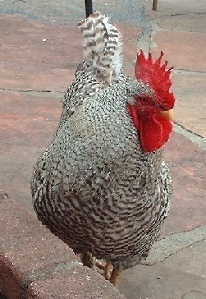 It can vary widely from breed to breed and from chicken to chicken. Some do it in the summer, some in the winter (when you figure it'd be the worst possible TIME to molt!). 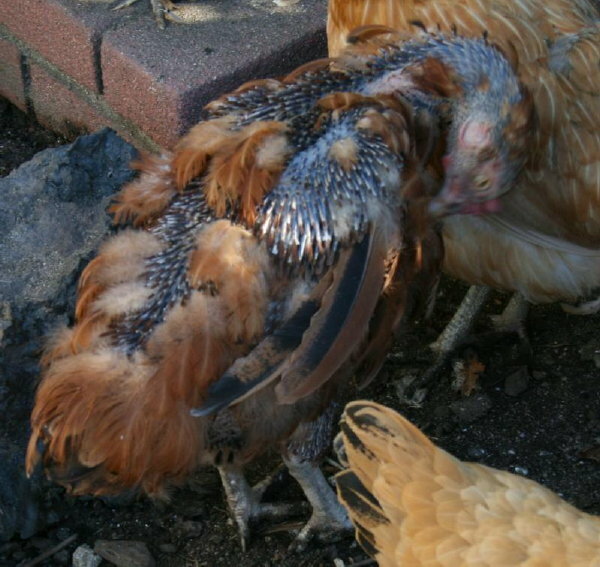 While molting isn't an illness per se, it IS a big stressor on the chickens' system. You can help your birds along by providing a bit of extra protein in their diet--growing new feathers takes lots of protein! Live mealworms or crickets, scrambled eggs, cooked ground beef, etc. are all great protein sources. 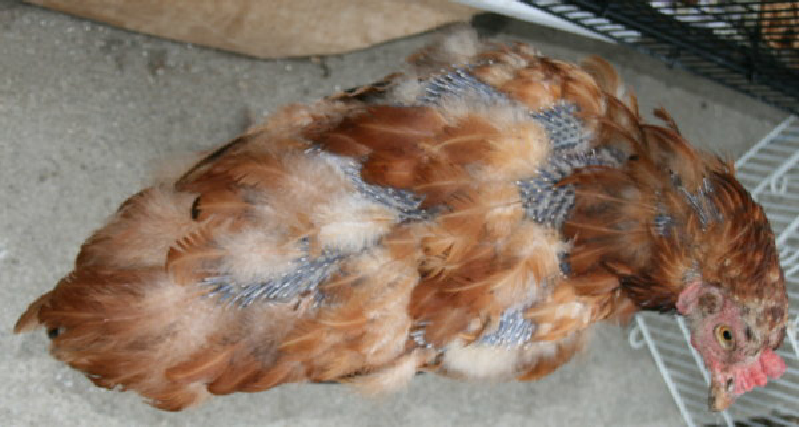 The one advantage to molting in the winter is that the cold weather can stimulate new feather growth. 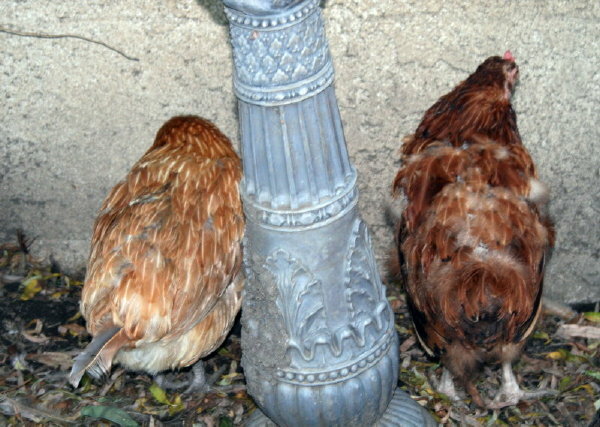 If your birds are molting in the winter, try to protect them from drafts. Especially important is to try not to handle your birds during a molt--those new pinfeathers HURT when they poke them when you pick them up! 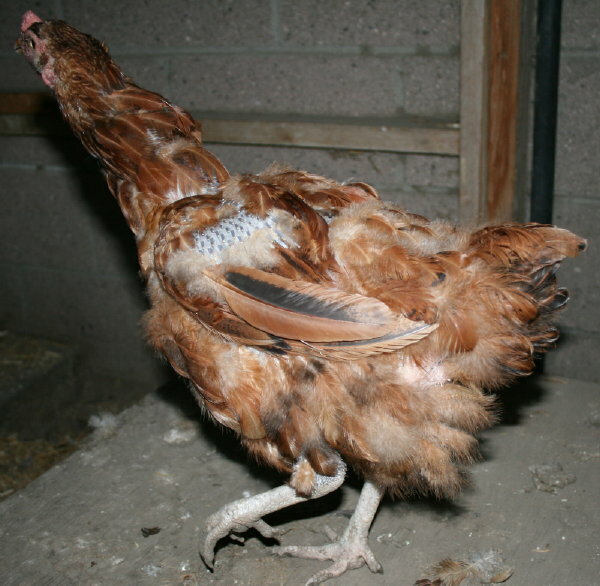 Also, blood feathers (new, growing feathers with the blood supply inside the shaft) can become broken off, which can cause significant bleeding, even to the point of endangering their health. 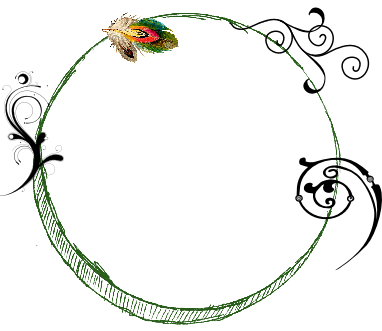 A broken-off blood feather can act like a straw, causing the bird to lose a lot of blood. If a blood feather DOES break off, apply a bit of Kwik-Stop (coagulant made for birds) if you have it, if not you can use a bit of cornstarch or even flour to staunch the bleeding. Beast kept checking over her shoulder to see if I was still there with the camera. 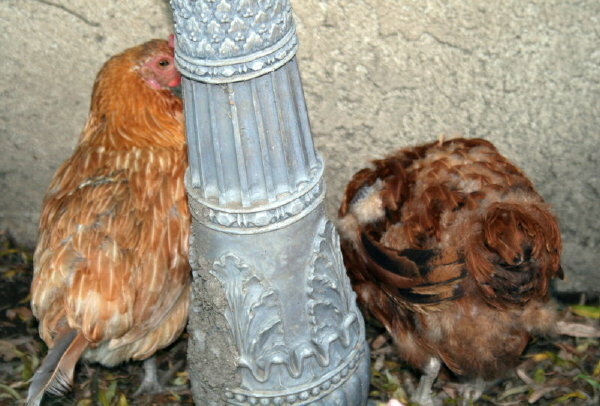 Beast did at least retain one tail feather for a while to help indicate her status. I think they know they look funny, poor babies! 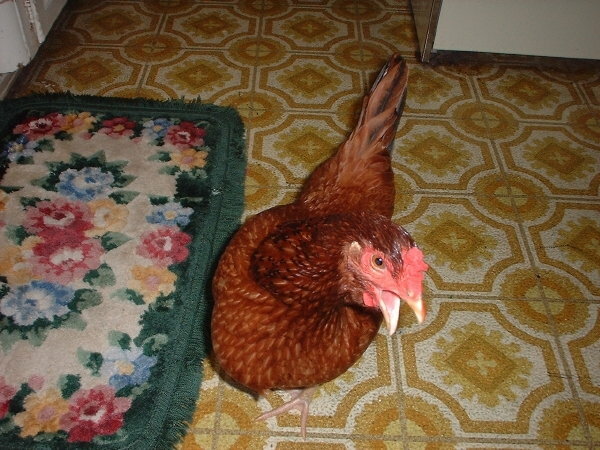 Chickens appreciate praise just like dogs & cats do, so coo at them and tell them how pretty they are to cheer them up a bit, it helps. It won't be long before they are carrying a beautiful new suit of feathers and an improved attitude.